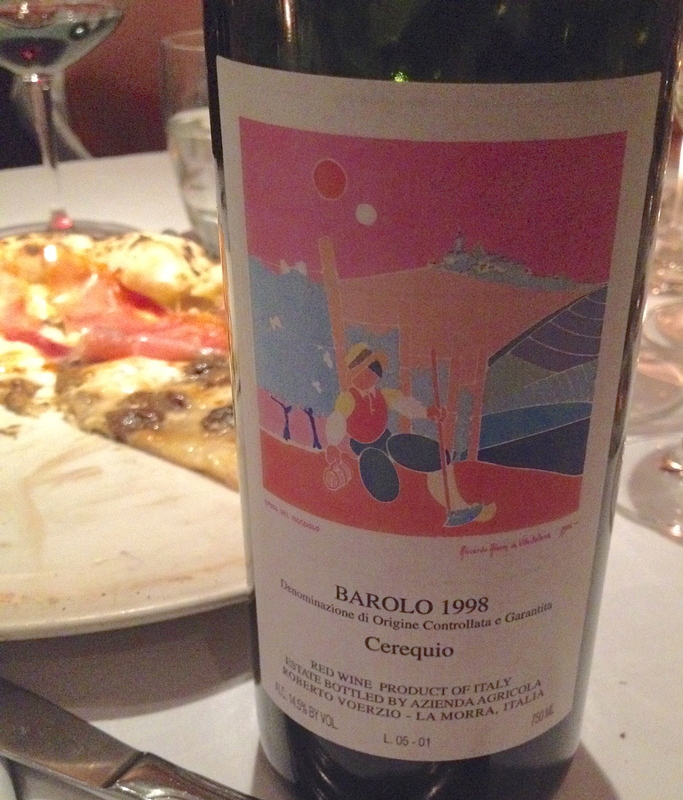 One of my favorite Barolo and pizza memories is from 1985. Michele and I visited Alfredo and Luciana Currado, owners of the Vietti winery with Mary Ewing Mulligan MW and Ed McCarthy. A Neapolitan man had opened a pizzeria a few doors away from their winery and they wanted us to try it. Their whole family joined us. 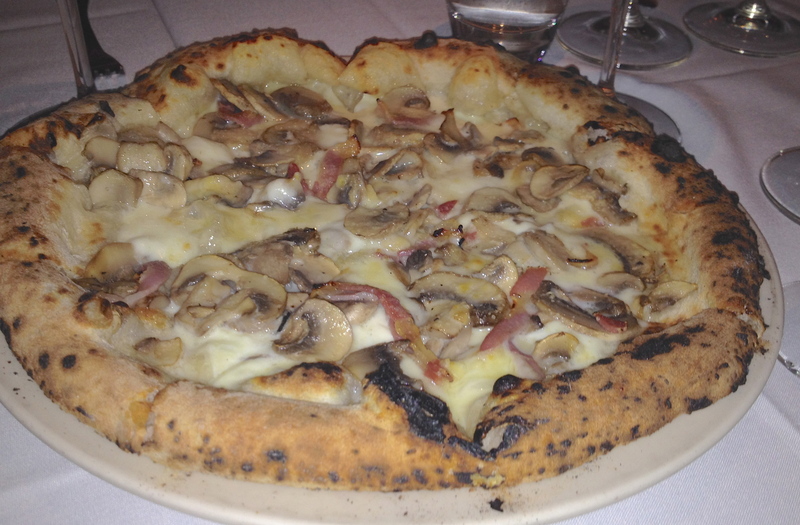 The pizza was very good especially the one made with Fontina Val D’Aosta cheese and porcini mushrooms. 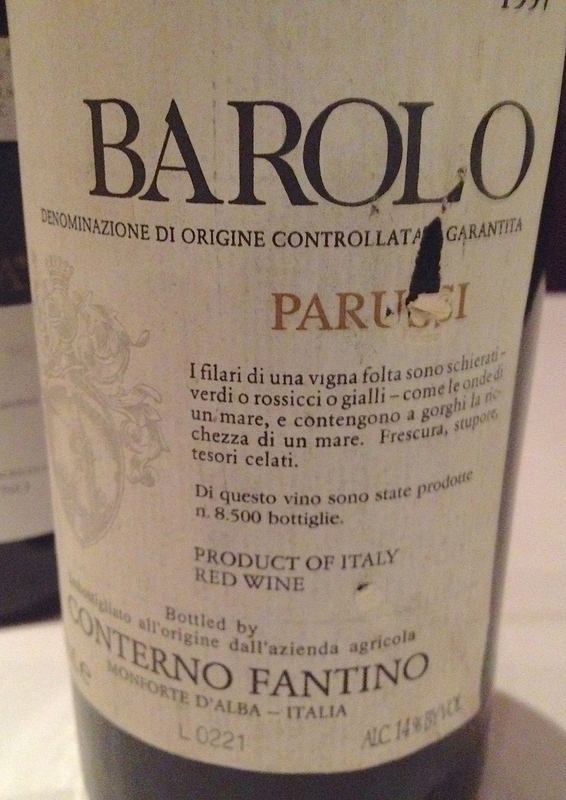 Alfredo brought a magnum of 1961 Barolo and he very proudly told us that this was the first wine that he had made. The wine was great with the pizza. 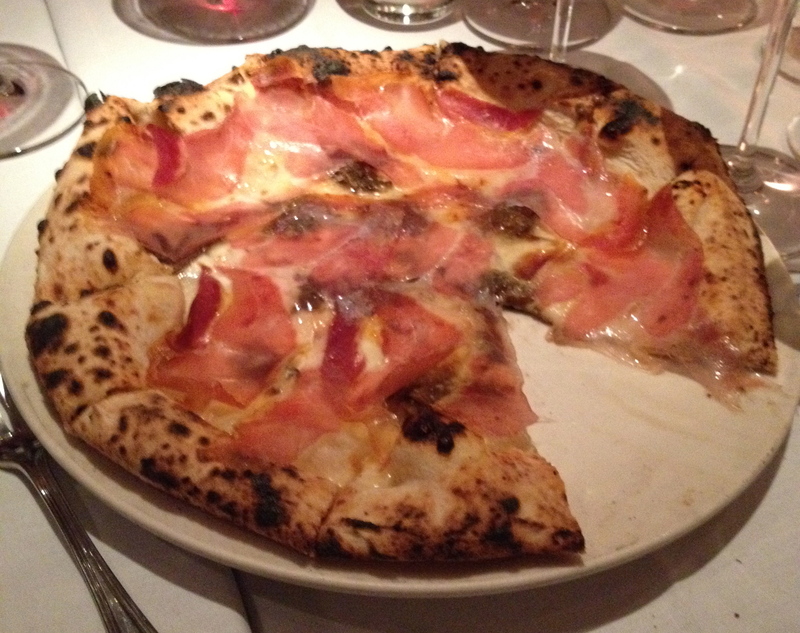 From then on, I was hooked on pizza and Barolo. Just before Christmas, Brad Bonnewell, owner of La Pizza Fresca in NYC, inviting me to a Barolo and pizza dinner a few days after Christmas and I had to accept. With the pizza there were two flights of Barolo, five from the 1997 vintage and five from the 1998 vintage. It was a blind tasting. 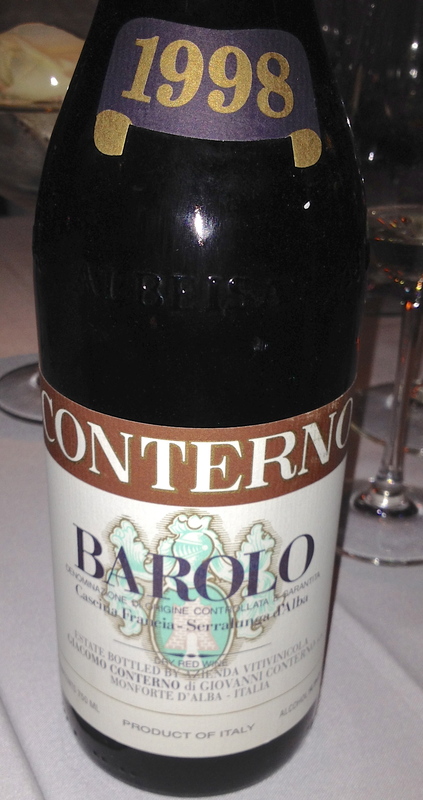 Some wine writers called the 1997 vintage Barolo “The Vintage of the Century”. It was given ratings in the high 90’s by the better- know wine writers. It was also rated a five star vintage. 1998 did not get the same recognition or hype, though some rated it 4 stars. The 1997’s that we tasted were more fruit forward, riper, and richer with less acidity. It seemed that they should be drunk before the 1998. The 1998’s were subtler and with more of the tar, leather, tea and faded rose aromas that I like, so we drank the 1997’s first. On another vintage note I would drink the 1997’s and 1998’s before the 1996’s, which I believe, is a great vintage like 1989. Barolo – Bartolo Mascarello 100% Nebbiolo from 3 hectares of vineyards: Cannubi 1.5, Lorenzo 0.3, Rue 0.5 in the commune of Barolo and Rocche 1.2 in the commune of La Morra. The vineyards are between 3 and 50 years old. This is the most traditional producer of Barolo and it is a classic old style wine. The Barolo is a blend of all the vineyards, the way it was done in the past before the other producers took up the “French Cru” designation. I have had these wines a number of times and they are usually among my favorites, however this night they were not showing well. The two bottles we opened might have been slightly corked, hiding the aroma and flavors of the wine. Brad said he had a case of the wine and the others he had opened had the same problem. 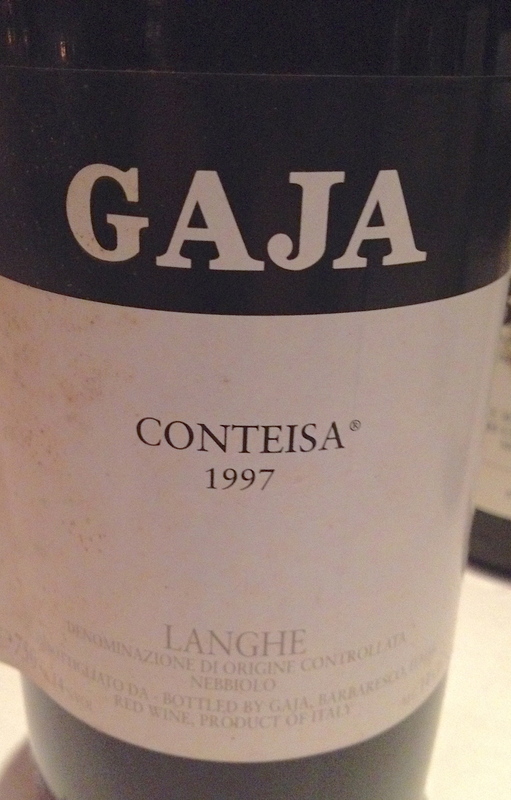 Langhe Nebbiolo Conteisa – Angelo Gaja. Mostly Nebbiolo with a little Barbera. Fermentation is on the skins in stainless steel tanks for 3 weeks. The wine is aged in barriques for 12 months followed by 12 months in large oak barrels. This is a well-made wine with less vanilla, oak aromas and flavors then I remember. Still, it is a little too modern for me. 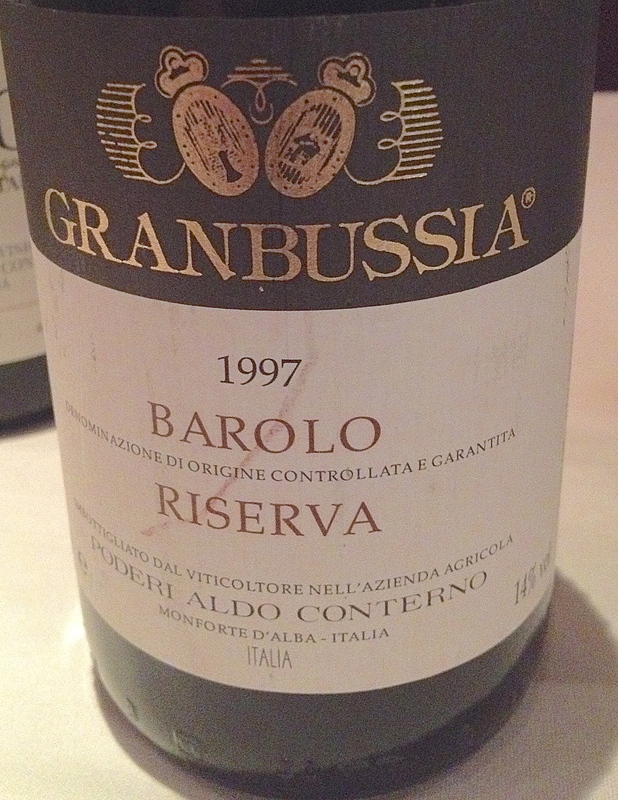 Barolo Grand Bussia Riserva – Aldo Conterno Nebbiolo: Michel and Lampia varieties. Grapes come from 3 different vineyards (Bussia, Monforte d’Alba). The grapes are hand harvested. The must remains in contact with the skins for 60 days, during which the alcoholic fermentation is fully completed. The wine is aged in large Slavonian oak casks for 32 months. The wine remains in the cellar for at least 8 years before release. Only in the best vintages is this wine made. 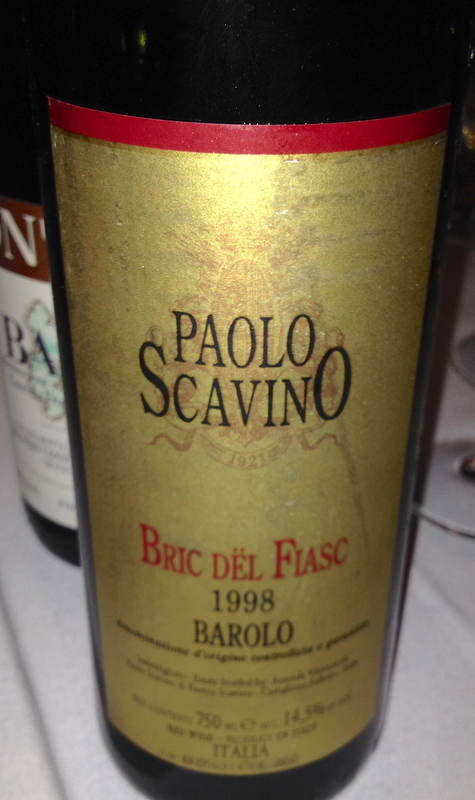 I have not tasted this wine in a long time and it was showing very well with all the true Nebbiolo characteristics. Barolo Cascina Francia – Giacomo Conterno 100% Nebbiolo from Serralunga’s Cascina Francia vineyard. The exposure is south/southwest and the soil is calcareous limestone. They use wooden vats with regular breaking-up of the cap. The wine is aged for 4 years in large oak barrels. This is classic, traditional Barolo at its best. Barolo – Parussi 100% Nebbiolo. The grapes come from Monforte d’Alba and Castiglione Falletto. There are 5,000 plants/hectare, with south/southeast and southwest exposure and the grapes are hand harvested. Destemming of the grapes and then maceration on the skins. Alcoholic fermentation occurs spontaneously with indigenous yeasts without the use of sulfites. The wine is aged in oak barrels for 24 months in contact with its native yeast and 6 months in bottle before release. Barolo Azienda Agricola Falletto of Bruno Giacosa, 100% Nebbiolo. The grapes for the Falletto wines are all estate grown. He uses traditional wine making methods. This is a wine with hints of liquorice, spice and tea. I like Giacosa’s Barolo but would rather drink his Barbaresco. Barolo Ciabot Mentin Ginestra – Domenico Clerico 100% Nebbiolo The vineyard is at 400 meters and the exposure is south/southwest. Maceration on the skins in temperature controlled stainless steel tanks for 12/14 days. Aged in French oak barriques, 90% new for 22/24 months and 6/8 months in bottle before release. This was the most modern style wine in the tasting with a lot of vanilla and oak. Barolo Cereqiuo- Roberto Voerzio 100% Nebbiolo There are 4,000 to 5,000 plants per hectare and the vineyard faces south/southeast. Fermentation is in stainless steel. The wine is aged for 24 months in used barriques and 20hl casks. Then 8 months in stainless steel and 8 months in bottle before release.This is another wine that I have not tasted in a long time but it was less modern then I expected. Barolo Bric del Fiasc cru: Castiglione Falletto (Fiasco) – Paolo Scavino 100% Nebbiolo. Destemming and light crushing takes place and maceration and fermentation is in stainless steel tanks. Indigenous yeast is used and malolactic fermentation takes place in oak for 10 months. The wine is aged in oak barrels for 10 to14 months in large casks, 1 year in stainless steel and 10 months in bottle before release. This was the second most modern wine. Barolo Cascina Francia – Giacomo Conterno 100% Nebbiolo from Serralunga’s Cascina Francia vineyard. The exposure is south/southwest and the soil is calcareous limestone. They use wooden vats with regular breaking-up of the cap. The wine is aged for 4 years in large oak barrels. This is classic, traditional Barolo at its best. The 1998 was my number one wine and the 1997 was my number two wine. They also went the best with the pizza. Brunello di Montalcino 1997– Mastrojanni. This has always been one of my favorite producers and when Brad asked what else he could open, this was my suggestion. Made from 100% Sangiovese Grosso. It is aged 3 years in Allier oak barrels of various sizes – 15, 33 and 54 hectoliters and then aged for 6/8 months in bottle before release. The wine has aromas and flavors of ripe black and red berries with a hint of spice and tobacco. 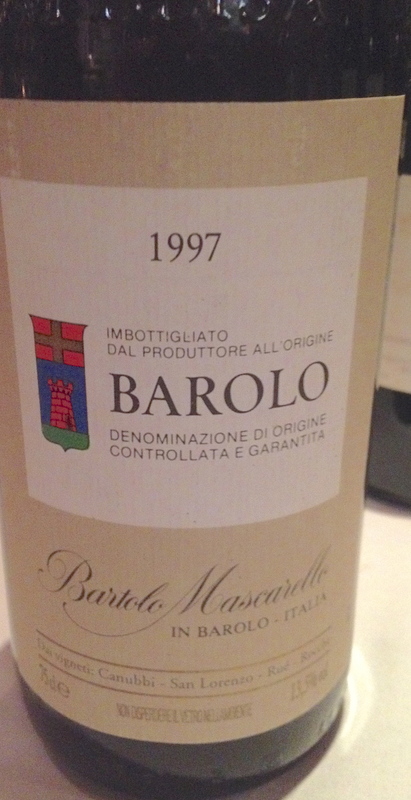 There was even more hype for the 1997 vintage for Brunello than for the Barolo. 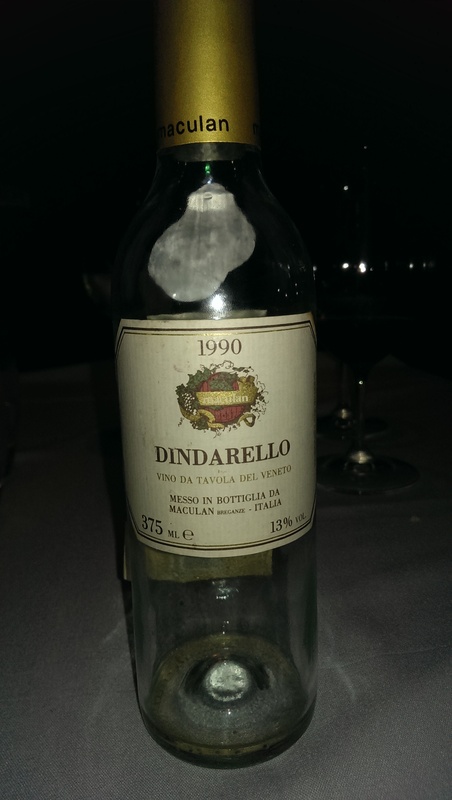 We ended with the dessert wine, Dindarello 1990 from Maculan. 100% Moscato from the 6 acre Dindarello vineyard on the estate.The grapes are dried for about a month, then fermented in stainless steel and aged another three months in bottle before release. This is an excellent dessert wine with hints of honey, tropical fruit and good acidity. In all, there were 16 wines at the tasting, but the 12 listed were the ones I remember drinking. I enjoyed Brad’s hospitality and the wine and pizza. I also enjoyed remembering my friend and a great winemaker, Alfredo Currado.